The expo. I went to the expo for the #IM703Panama at the Hilton for the athlete Check-in on Saturday. It had started on Friday, and I heard people complain about how slow it had been the day before. By the moment I got there, it was very efficient, and in about 5 minutes I had gone through all the process and was good to go… into the stores at the expo! The Official Ironman store didn’t have much to offer. I had the idea of going crazy with Ironman products, but I ended up getting just a shirt. Probably they had sold most of their products earlier. The other stores weren’t many compared to a race expo in the US, but they were well stocked. They had good deals in some items. I had spent some time the week before learning how to fix a flat tire with a CO2 inflator, so I got two CO2 refills for the race. The Race briefing was good. I guess once you’ve been to one race they become repetitive, but being my first race I was listening to every single detail, since I wouldn’t like to get disqualified because of something silly. They had some problems with the bike course, so they had to change it last minute. The instruction we got was: just follow the person in front of you. Later, I went to drop my bike off at the transition area around 5pm. I didn’t leave the CO2 refills, since I planned to bring them along everything else on the next day, which I learned after the race that I had forgotten. Fortunately I didn’t end up needing them anyway. I used that time to understand the transition area, the swim course, and drove along the run course to get to know it. Before the race. At 4:00 AM I was awake, calmed and ready for breakfast. I had instant oatmeal, which is what I ate 2 hours before my swim sessions. I arrived early enough to have time to set my transition items carefully. I went to body marking, and loved my number: 300. They announced we would be allowed to wear wetsuits because of the water temperature. Everyone says it gives you an advantage in the water; however, since it’s quite tight I felt nervous about taking it off later with the ankle chip and the Garmin watch. I didn’t apply sunblock yet, since the swim was early, and I thought it would feel sticky inside the wetsuit- Mistake! Around 15 minutes before my start time, I got to the dock. The elite group started a bit delayed. I ate my energy gel with caffeine, which I was keeping for the start. After that, my start group had to wait for still one more hour, and my gel was very well digested by then. My anxiety was building up, the sun was coming up with a perfect clear sky and I was already sweating inside all that neoprene, but I felt happy. I was lucky enough to have the girls from my team in Colombia, and other girls from Guatemala to make the time pass by. Swim. I have been swimming for less than six months, and I have been taking it easy so I wasn’t expecting a fast swim. I was the last one to go into the water, and felt left behind. Probably this wasn’t as bad as I thought since I didn’t get kicked, hit or pulled by others along the course. In the water I often realized how I wasn’t swimming properly, and tried to concentrate on my technique. The nerves didn’t allow me to swim properly. I expected to swim in about 50 mins, but luckily we were swimming along with the current so I took 40 mins 20s. I’m glad I can comfortably swim 1.9Km in such a short preparation time, although I know I still a lot to improve. Bike. The temperature when I started cycling was around 30°C (86°F). Just after I started two guys crashed in front of me, and I avoided falling after them as fast as I could. This made my heart pump really fast. After that I was able to start my Garmin again. We had to go on for three loops with curves and a few U-turns. The course was flat with the exception of a couple of bridges, but by the third lap I couldn’t cycle fast anymore. I had never ridden more than 70 Km, and my legs felt tired. I tried eating along the way, but probably I was not eating enough. In the last water station they ran out of cold water, so I stopped to freshen up. It was hot, and few volunteers came around me and my bike and soaked me in water and refilled my Gatorade bottle. I regained strength and kept going. Probably the two hardest moments I had in the race were: the moment when I couldn’t feel my feet anymore, and feared not being able to stand when I finished cycling, and when I saw Daniel in the crowd and started crying. I think that the feeling I had was worse than the result, since I finished in 3h 11m. I thought it would take me longer to finish 90 Km. Transition 2. I had to go to the toilet. Apparently athletes pee while cycling, or running. I can’t do this and I don’t know if I want to be able to do this. I was afraid I would forget to wear my bib number, but I didn’t. It was time to get going into my favorite part. Run. By this time it was already 32°C (90°F). I started running the first 5 Km at a good pace. Since I was switching from cycling to running, my legs wanted to move fast. I tried to force myself to slow down. I started feeling very tired when I caught up with Laura from my team, and we kept going together for about 6 Km at a steady pace which made it better. Then I started going a bit faster for the rest of the race. I thought I would be able to run faster, but I hadn’t considered how tired my legs would be after the 90 Km bike. However, running feels much more natural to me than the other two sports. I focused on staying cool with water and ice. I ate three energy gels, although I didn’t feel like having them. I am proud to say that I didn’t walk at all. When I had about 500 m to go I found hidden energy reserved to go much faster and cross the finish line as a winner, or at least that’s how it felt. 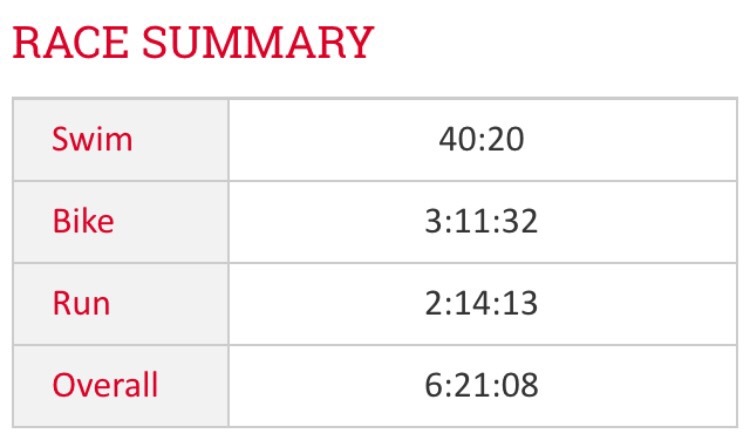 I finished the half marathon in a in 2h 14m, which made 6h 21m 08s in total. So this is it! Thanks everyone who has been there for me from close and far, and to my mother who sees all I do from above. Gracias Camilo! Definitivamente se entiende hasta que uno lo vive! Ahora vamos para adelante con nuevos retos. Incredible superwomen! From her heart congrats for such a goal completed ..hope to see you soon in the next race! I am a fun big hug!